Fenton introduced their Coin Dot pattern in 1947 and continued production through 1964. It remains one of their most sought after patterns. 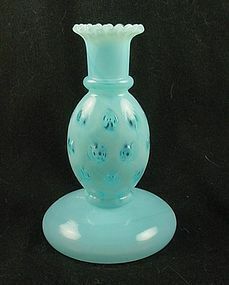 Offered here is the #1470 candlestick in blue opalescent. 5 1/2 inches tall. See my other listings for more in this pattern. 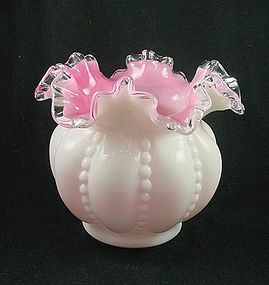 Rose Crest is was produced by Fenton from 1944 to 1947. 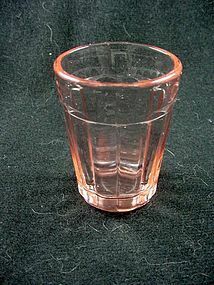 It was originally made as an exclusive for Weil Freeman Company in 1944, but when they didn't renew the contract, Fenton added it to their regular line and continued production until 1947. 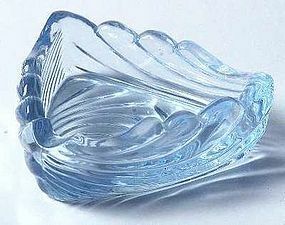 Offered here is the 4 inch ruffled vase in excellent condition. See my other listings for more in this pattern, as well as other Fenton Crest colors. 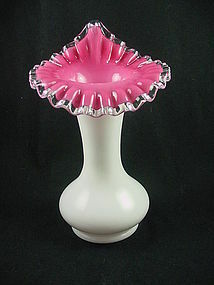 Rose Crest is was produced by Fenton from 1944 to 1947. It was originally made as an exclusive for Weil Freeman Company in 1944, but when they didn't renew the contract, Fenton added it to their regular line and continued production until 1947. Offered here is the center horn that fits the 1522 epergne. It's in excellent condition - grab it to complete your set! See my other listings for more in this pattern, as well as other Fenton Crest colors. 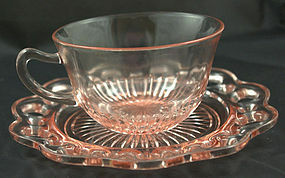 Rose Crest is was produced by Fenton from 1944 to 1947. 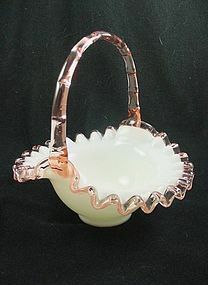 It was originally made as an exclusive for Weil Freeman Company in 1944, but when they didn't renew the contract, Fenton added it to their regular line and continued production until 1947. Offered here is the 7 inch basket in excellent condition. See my other listings for more in this pattern, as well as other Fenton Crest colors. 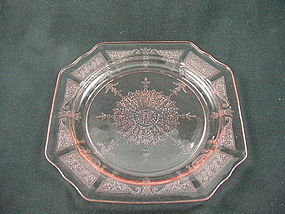 Rose Crest is was produced by Fenton from 1944 to 1947. 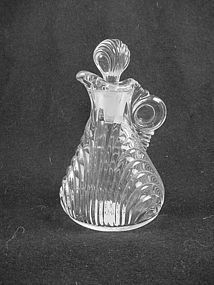 It was originally made as an exclusive for Weil Freeman Company in 1944, but when they didn't renew the contract, Fenton added it to their regular line and continued production until 1947. Offered here is the 6 1/2 inch upright basket in excellent condition. See my other listings for more in this pattern, as well as other Fenton Crest colors. 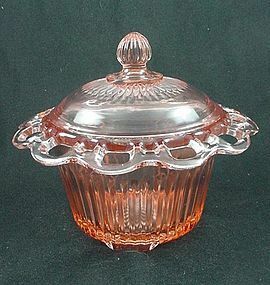 Peach Crest is the name for this wonderful Fenton pattern that combines ruby glass cased over milk glass and then finished with a clear edge. It was produced from 1940 through 1967 and is highly sought after today. 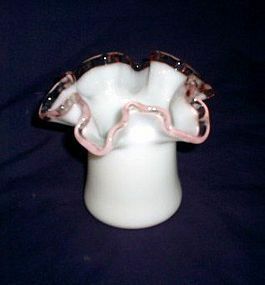 Offered here is the #7250 8 inch Tulip vase in excellent condition. See my other listings for more in this pattern, as well as other Fenton Crest colors. 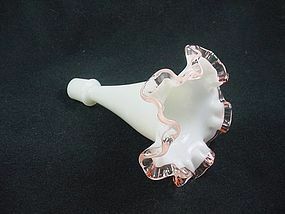 Peach Crest is the name for this wonderful Fenton pattern that combines ruby glass cased over milk glass and then finished with a clear edge. It was produced from 1940 through 1967 and is highly sought after today. Offered here is the #711 Beaded Melon vase in excellent condition. This vase is 5 inches tall. See my other listings for more in this pattern, as well as other Fenton Crest colors. 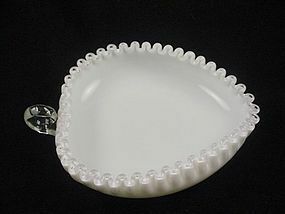 Ivory Crest was only produced by Fenton Glass Company for one year, 1940 -1941, making it one of the scarcer crest patterns. 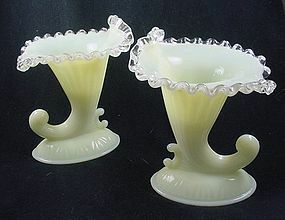 Offered here is a pair of #951 cornucopia candlesticks. These are 6 inches high and in excellent condition. Price is for the pair.See my other listings for more in this pattern, as well as other Fenton Crest colors.